As the regular session of the Diet winds down — and with the government's priority legislation passed — it seems that the matter of Agriculture Minister Matsuoka Toshikatsu has returned to the forefront of the national political agenda. Of course, each week seems to bring new news of Matsuoka's wrongdoing, and more criticism. On Saturday, at a general meeting of the Gifu branch of the LDP, Kaneko Kazuyoshi, chairman of the Lower House Budget Committee, suggested that Matsuoka should resign after the Diet session ends and further suggested that a cabinet reshuffle may be in order. This is in light of revelations this week that Matsuoka received donations from construction companies that received contracts from the Japan Green Resources Agency ('J-GREEN') of the Ministry of Agriculture, Forestry, and Fisheries. 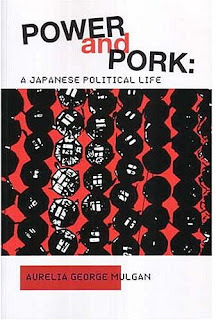 Readers of George Mulgan's book will find that this is entirely consistent with the span of Matsuoka's career. Matsuoka has excelled at securing public funds for corporations, which subsequently direct donations to his political support groups. In short, putting Matsuoka at the head of MAFF is about as good an example of putting the fox in charge of the chicken coop as one can find. Of course he should be forced to resign. But that's a matter of course. Political reform, starting with measures to require detailed reporting of all donations and expenditures by political support groups and measures to curtail interaction between bureaucrats and Diet members, is needed to deprive Japan's Matsuokas of opportunities to pervert the system to private ends. Will the newly buoyant prime minister add political reform to his agenda, starting with the sacking of Matsuoka? With Abe, and Nakamura Shoichi, Abe's id, defending Matsuoka, not bloody likely. The Economist is a bit late on Abe. Today's Nikkei puts his cabinet's approval back at 41%. Perhaps the bounce was a dead cat.